The traditional styling of this Brunswick Centennial wooden swivel stool blends beautifully with your favorite pool table and furniture. This stool is only available in bar height. Available in multiple stains. The Centennial stool is perfect for the Centennial bar, or any bar or pub table in your home. The Brunswick Colonial backless swivel stool is available in multiple stains to match your Brunswick pool table. This stool is only available in bar height. 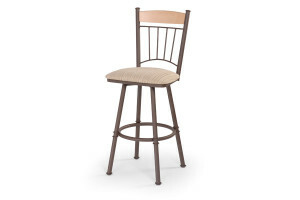 The Colonial barstool is a great enhancement for your bar, pub table or game room. This sleek Regal wooden stationary stool is perfect for any bar or kitchen. Available in multiple stain and fabric or vinyl options, or without upholstery. Available in bar or counter height. Regal stools are also popular in the hospitality industry, so you know they are built to last. Made in the USA. A touch of modern style blends beautifully with the classic lines of this California House wooden stool. Available in Maple or Oak with multiple stain and fabric or leather options. Other options are available to help you create your own custom stools. Available in bar or counter height. Enhance the beauty of your bar or game room with this stunning stool. No detail is overlooked in bringing you these incredibly well-built and comfortable stools. Made in the USA. Another stunning California House classic wooden stool with arms and swivel. Available in Maple or Oak with multiple stain and fabric or leather options. Other options are available to help you create your own custom stools. Available in bar or counter height. Enjoy the ultimate in comfort. No detail is overlooked in bringing you these incredibly well-built and comfortable stools. Made in the USA.